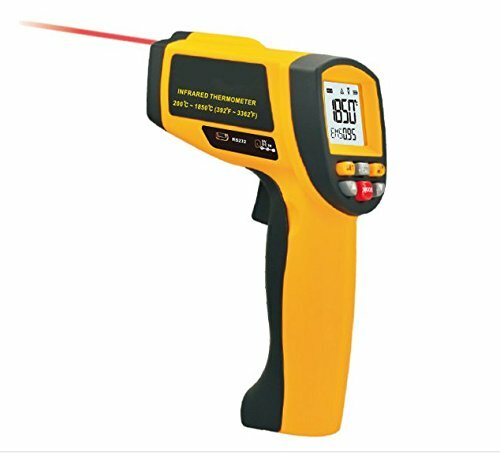 This infrared thermometer is used for measuring the temperature of the object's surface, which is applicable for various hot, hazardous or hard-to reach objects without contact safely and quickly. This unit consist of Optics, Temperature Sensor Signal amplifier, Processing circuit and LCD Display. The Optics collected the infrared energy emitted by object and focus onto the Sensor. Then the sensor translates the energy into an electricity signal. This signal will be turned out to be digital shown on the LCD after the signal amplifier and processing circuit. This unit doesn't include batteries. Because the international air shipping forbid us to ship liquid, powder and batteries, so we can not put them in the package. Hope you can understand & buy the batteries in your local store or supermarket. Thanks for your support!